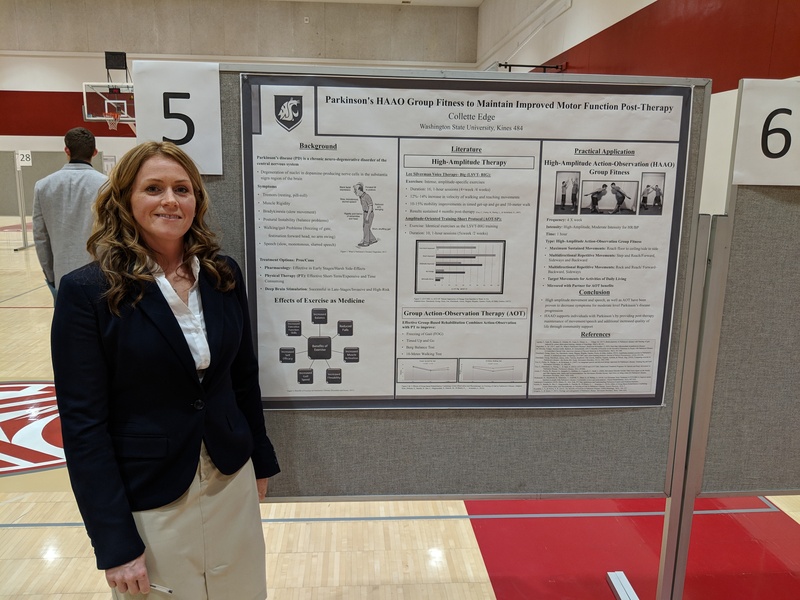 Washington State University’s Kinesiology program hosted its 2018 semi-annual Bruya-Wood Undergraduate Research Conference on Nov. 30. While all presentations were top notch, when all was said and done, Collette Edge won the grand prize for Outstanding Work. Collette’s research was titled: “Parkinson’s HAAO group fitness to maintain improved motor function post-therapy”. Pharmacology: Effective in early stages, but with hard side effects. Physical Therapy: Effective short-term, but expensive and time consuming. Deep brain stimulation: Successful in late stages, but invasive and high-risk. Using research literature based on high-amplitude therapy, as well as group action-observation therapy, Collette presented something called High-Amplitude Action-Observation (HAAO) group fitness. As a practical application, it includes maximum sustained movements like reaching from floor to ceiling and side to side, as well as repetitive movements like a step-and-reach, rock-and-reach, etc. Unlike physical therapy, because this is a group setting, it offsets some of the high costs. High amplitude movement and speech, as well as group action-observation therapy, have been proven to decrease symptoms for moderate level Parkinson’s disease progression. HAAO supports individuals with Parkinson’s by providing post-therapy maintenance of movement/speech and additional increased quality of life through community support. Collette has been a group fitness instructor for the last 13 years on the Palouse, but went back to school, and will continue on to graduate school in occupational therapy. She said she would like to work in therapy for vulnerable populations such as people with Parkinson’s disease. From the Bruya-Wood Conference, Edge joined the college’s podcast Education Eclipse. Congrats to Collette, as well as the rest of the conference participants.